Rose Bainbridge takes Janett Laxton across the Amerigon wilderness to Founsteeth on request of one of the pirate city’s Three Captains. A relatively simple task of negotiating the trade of a prisoner becomes a nightmare as a storm hits the city, accompanied by legions of the Ubasi. Rose is left with a hunt to rescue Janett from the walking corpses of the Ubasi and the dark shaman who has returned to claim his revenge. 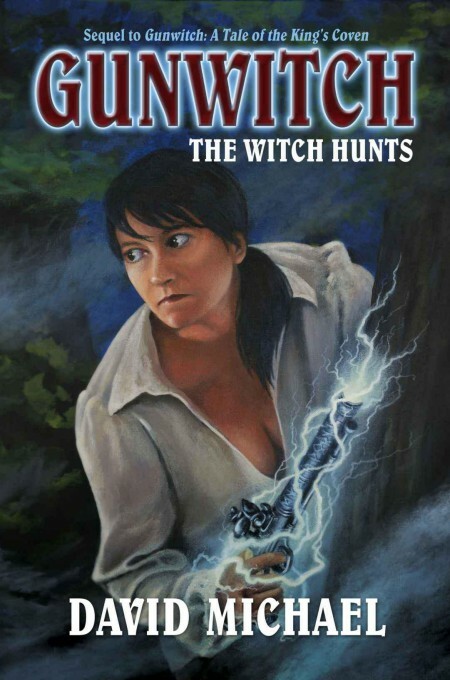 Gunwitch: The Witch Hunts is the second of the Gunwitch novels, the first having been reviewed previously on this site (click here). It has been a while since I read the first novel, but I was immediately familiar with Rose, Janette and Major Ian Haley. An incident prior to the initial arrival at Founsteeth hints that Janett is not likely to be merely an accessory – a girl that needs to be rescued. Her character develops as the story progresses and she has a few revelations for the reader which are likely to change her standing if there is to be another book in the series. We have not completely lost Margaret, her sister from the previous novel. She makes a few dream appearances, almost as an oracle, but the messages seem to relate to possible developments in a following novel as none felt resolved by the end of this book. Rose is still the heroine of the story and she’s a character I rather like. She’s tough, intelligent, insightful and very resourceful. One of the aspects of the first novel I enjoyed was the parallel telling of Rose’s back-story. In this novel, more of her history is unveiled, triggered by her unlikely pairing with a Hexen, a male witch. Can Rose trust an unexpected comrade, who once fought with the German Emperor and elicits horrifying memories of death and destruction? We also see Rose’s feelings towards Major Haley attempt to grow through the many walls Rose has erected around herself. This development did not feel bolted on – it seemed to flow naturally from past experiences and fears, which I appreciated. The plot was a strange mix of elements that worked very well and some baffling let-downs. The scene of the storm was well told and sufficiently exciting to keep the pages turning and the determined hunt into enemy territory worked well as a whole. I liked the mixture of voodoo and steam, and the play on zombies with the continued use of the ithambofis. However, the introduction of new character Sipho was problematic and, in my opinion, bungled. Once Sipho was properly introduced to the reader and his role became known, a quick reflection showed that the preceding chapters were merely for that purpose and not to tell a story that made any sense; his previous actions were completely unnecessary to arrive at the same destination. The Hexen, while an interesting addition to the story, existed to create a plot twist regardless of the damage to the story’s logic. His previous actions, when viewed in the light of revelation, made no sense at all. I found the prose to be well-constructed and flowed well. There were a few more typos than I would have liked, but the errors never became too distracting. Whether dealing with Janett’s journey in the clutches of walking horrors or exploring Rose’s reluctance to fully commit to Major Haley, the writing promoted immersion and I quite often had a strong picture of the scenes presented, especially the action scenes. Gunwitch: The With Hunts leaves a couple of story arcs incomplete and enough territory unexplored for at least one more novel in the series. Despite my disappointment with some of the story construction in this episode, I am interested in the story’s direction and am enjoying the character of Rose Bainbridge enough to partake of the next episode when it arrives. This entry was posted in 3, Fantasy, Novel and tagged Fantasy, Series, Steampunk. Bookmark the permalink.